UK’s regional airline FlyBE is in the process of restructuring its business model as the once high flying regional airline suffers from 3 years of widening losses. This case shows how regional airlines are struggling around the world, trying to find their market place between full network airlines (FNA’s) and low cost airlines (LCC’s), and an example example of what a regional airline has to try and do to survive in today’s highly competitive market. Airlines such as JAZZ (Chorus), LIAT and many others can learn from FlyBE’s restructuring and mistakes to better prepare for the future. FlyBE is in big trouble but the difference to many other regionals that are in trouble, like LIAT (previous article), is that management is doing something about it. FlyBE is increasing aircraft and flight crew utilization, franchising various markets to other carriers with more appropriate aircraft, reducing fleet count, reducing employees, optimizing route network, better yield management, reducing overhead and management layers, stopped serving unprofitable destinations and dropping hubs and starting new hubs where there are more premium yields, and better traffic projections to contract flying “white tail flying” for other airlines at the same time itself wet leasing in low cost ACMI operators to serve some routes that it could not serve with its high cost base, this is wonderful REACTIVE turnaround by a very competent airline management team, a lesson to all those regional airlines out there that are in denial about their troubles and doing nothing about it, just hoping things will get better! remember HOPE is NOT a STRATEGY. FlyBE is the UK’s largest airline serving secondary routes, and is trying to reinvent itself again as it tries to find a sustainable business model to survive, it tried smaller SF340/ATR-42’s aircraft to secondary markets, then tried a quasi low fare model with larger EMB-175/190’s and Q400’s and losses continued. 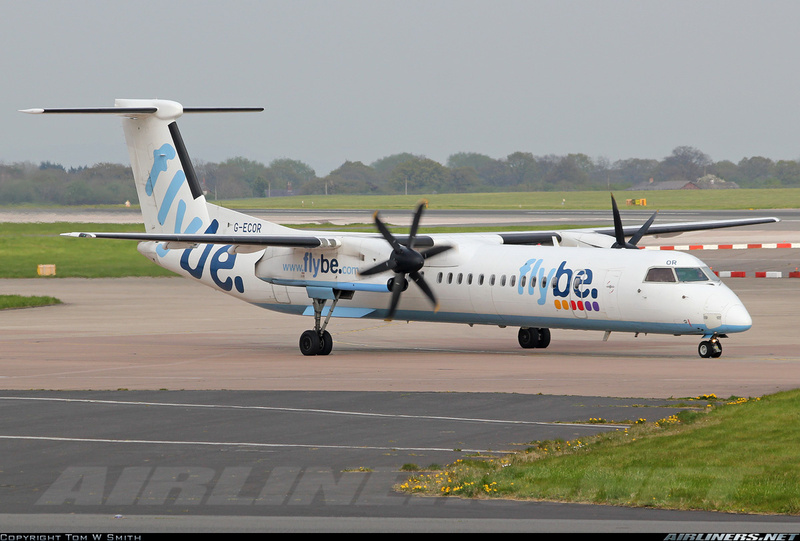 Regional airlines in Europe are hurting, traffic is down 10% and capacity was cut 13% and the contraction continues, FlyBE had to make drastic changes to its business model. First, it had to make changes at the top, and and long time CEO/Chairman was replaced new CEO Saad Hammad (ex-COO at EasyJet), who has been working since August 2013 to change the 98 aircraft (13 x EMB-195 (118 seats), 11 x EMB-170 (88 seats), 45 x Q400 (78 seats), 12 x ATR-72, 12 x EMB-190, 2 x ATR-42 and 2 EMB-170) with 2,730 employees and in need of a turnaround/restructuring and quickly as possible. The total seating capacity of the fleet is 6,960 and average aircraft has 82.9 seats and only 5.3 years old, a young modern fleet. 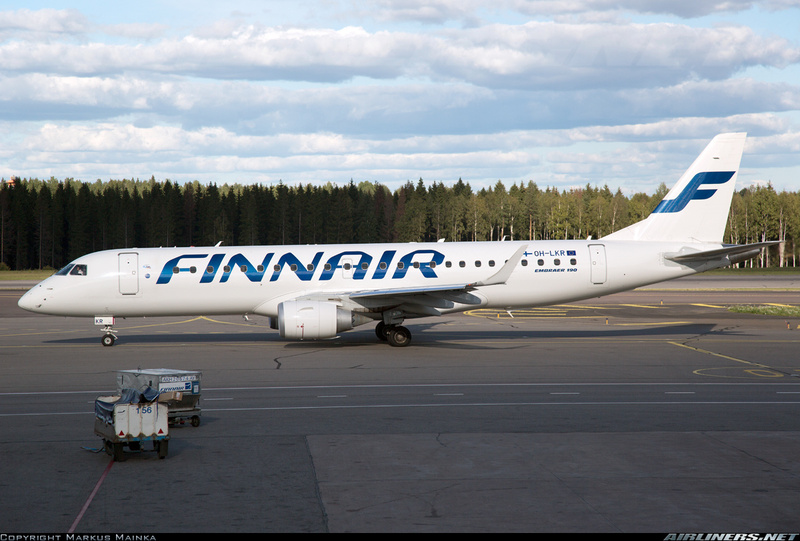 On the plus side, the airline has a strong niche in the UK market and has a growing foothold in the European mainland market, with 28 aircraft (12 x ATR-72, 2 x ATR-42, 2 x EMB-170 and 12 EMB-190) flying for FlyBE Finnair in Finland with 21 aircraft on 22 routes in what is called “White Tail Flying” which is contract flying for other airlines and has NO commercial “risk” and 7 aircraft in Finland flying under its own “risk” on 6 routes, while 4 aircraft (4 x Q400’s) are “White Tail Flying” for Brussels Airlines in Belgium, where all of the commercial risk is with Brussels Airlines leaving 66 aircraft are in the UK, it has pushed back deliveries of 16 EMB-175’s that were due in 2014 and 2015 and will not come until 2017+, if ever. The airline is positioning itself to be “The Best Local Airline in Europe”, but it has a great deal of problems to overcome, mainly its cost base is totally uncompetitive with its competitors, mainly the LCC. The BIG problem is cost, on its UK average sector distance of 250 miles CASM is around $US0.296, while LCC competitors like EasyJet have longer average stage lengths with larger A310/A320 aircraft have a CASM of $US 0.132 and Ryanair at $US 0.124/ASM. Cannot compete with smaller aircraft flying shorter sectors with costs per ASM 2.2 times higher, so #1 priority is bring those costs down as much as possible, though a regional airliner with 70-118 seats will NEVER match a LCC 186 seat B737-800 or A320 on CASM, so you need to stay away from such direct competition at all costs. Bombardier is finding that out with the CS100 and CS300 as airlines are just not seeing the economics of the new CSeries airliners, while Boeing B737 Max and Airbus A320NEO sales climb monthly. To lower costs, you need to increase aircraft utilization to spread out financial and other costs over more flight hours per day/month/year. Right now FlyBE is utilizing its fleet at only 5.3 hours per day, way too low for new expensive equipment, if you have old low cost aircraft like US based Silver Air with saab 340’s you can get away with only 4 hours a day, but when you have a EMB-170 at lease rates between $US 145,000 to $US 220,000 per month the difference in cost per hour at $180,000 per month lease rate is $397 per flight hour less if you fly 8.4 hours a day versus only 5.4 hours per day, big difference over the course of a year. Now FlyBE is up against Ryanair and EasyJet that fly 9.0+ hours per day. Of the 98 aircraft FlyBE operates it owns only 9 and leases 89. 1. Optimisize configuration, rationalize the route network, remove excess capacity as utilization goes up and aircraft and flight crew scheduling is optimized. The airline flies 158 routes, and of those 7 do not cover DOC’s (direct operating costs), 21 do not cover DOC’s plus crew costs and 61 do not cover DOC’s plus crew costs plus aircraft costs, leaving 69 routes (44% of routes) that contribute to overhead and profits ? not good. This is an interesting way of analyzing route economics. I have not seen such a breakdown, generally you have 1) direct variable costs, which are passenger variable and flight variable costs, driven by the number of passengers, flights and landing 2) direct fixed costs, which takes in aircraft ownership costs, insurance, training, maintenance and crew costs, driver of these costs is utilization (block hours) and 3) indirect fixed costs, which is station costs, sales and administration costs driven by ASM’s. Profit contribution (PC) levels can be several levels as by differentiating multiple levels allows an airline to analyze contribution to profitability by looking at different cost components. So you would take the revenue for a flight and then for PC1 you would subtract your direct variable costs (DVC) which gives you Profit Contribution 1 (PC1), next PC hurdle is PC 2, where you subtract direct fixed costs (DFC) and DVC to get PC2 and finally to get PC3 you subtract DFC, DVC and indirect fixed costs (IFC) to get Route Profitability (RP), on point to point services. Now with connecting traffic you will need to prorate revenues (milegae based or full fare ratio basis) of the connecting passengers and add to the Revenue equation at the same time on the cost side you will need to sub-tract the passenger variable costs of the connecting passengers this will give you Network Profitability (NP), analyzes the flight as a component of a larger network of point to point routes. Anyway, the more detailed your Route Analysis, the better ‘feel’ you have for your different cost components on each flight, and how you are are are not covering all your costs. Initial route start-up may only cover PC level 1 (direct variable costs) but slowly and hopefully it will move into PC2 and eventually PC3 (covering all direct variable, direct fixed and indirect fixed costs), again I digressed, sorry. 2. Reduce costs further, simplify the organization, take our layers and flatten the organization chart, lay off if need be, but with 39 employees per aircraft in the UK that is very good, LIAT has 71 (previous article). 3. Improve commercialization, optimize pricing, better yields, lower costs from above better utilization. of all assets, this will change that profit equation RASM (LF x Yield) versus CASM, as long as RASM >CASM you are in operating profit territory, that is good, the bigger the spread the bigger the profit. The steps have all been good till now, sold all its slots at Gatwick to EasyJet, and at the same time enters London Southend Airport market where there is little competition, but low yields, so they contract out (yes the the White Tail Flying company contracts out flying to another company), this goes to Stobart Air (ex-Aer Arann, and now part of Stobart Group) no positioned as a specialist in contract flying to fly 2 x ATR-72’s to 6 destinations on a 5 year franchise Agreement! as FlyBE recognizes it has a problem with costs, so it hires someone with lower costs to fly for it, smart but could you not be working with a future competitor if their costs are so much lower ? The airline has also wet leased in 3 Carpatair (Romanian regional) Fokker F100’s as of April 1st to operate flights to the UK, Germany, France and Ireland, so while it lays of hundreds and grounds 10 aircraft, it leases in lower cost operators, how sad is that, when you are better off wet leasing (ACMI) aircraft rather than operate the one’s you have with your own crew ? that says novels about the state of the airline’s un-competitive cost structure, a very gutsy move by the CEO to make such a move. 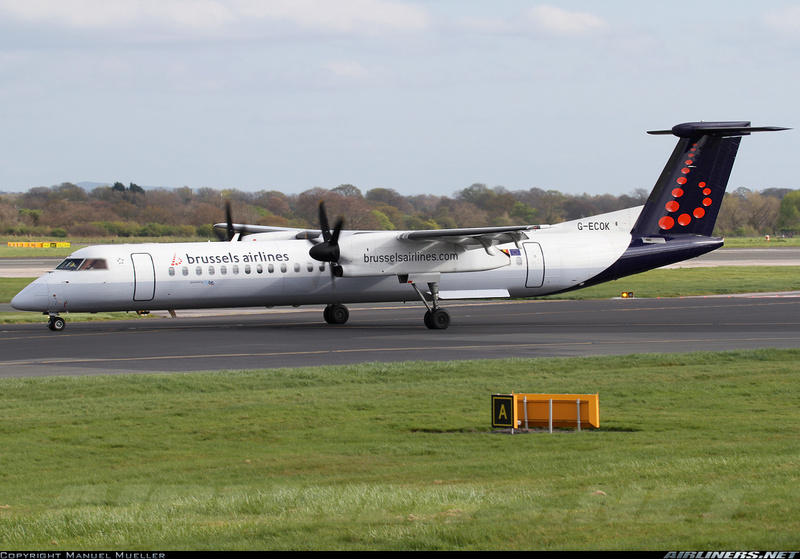 The ATR-72 franchise deal with Stobart Air is not new to FlyBE, they have already an agreement with Loganair (formerly owned by BA) in Scotland for several years, as Loganair flies its 28 aircraft in FlyBE colors (14 x Saab 340B’s, 5 x Dornier 328’s, 2 x DHC-6’s, 2 x BN2 islanders, 2 x Saab 340A Freighters and just added 3 x Saab 2000’s) throughout Scotland, Orkney, Western and Shetland Isles. I am going to digress here on the Saab 2000 briefly, love the plane, only 63 were built, they are a fast 50-58 seat turboprop at 370 kts (685 km/hr) and was chosen to fly in Scotland because “superior crosswind capabilities and excellent performance in and out of short airfields”. The aircraft has been under estimated by the market as everyone went for 50 seat jets, but with a 50 passenger range of 1,025nm and able to 31,000 feet and climbs at 2,250 feet per minute it has lots of power (4,152 shp per side with its Allison AE2100A engines) and on a 200nm sector burns only 1,555lbs of fuel and on 500nm only 3,065lbs of fuel. Never made it in North America, a few corporate owners, but no airline bought them sadly. Still worth a look, great support from Saab and good economics and faster than the Q400, the big Saab 2000 operators today are Swedish-Golden Air (9), Romanian-Carpatair (8), UK-Eastern Airways (8) Russian-Polet (5), Swiss-Darwin (5), Moldavian-Moldavian Airlines (2). 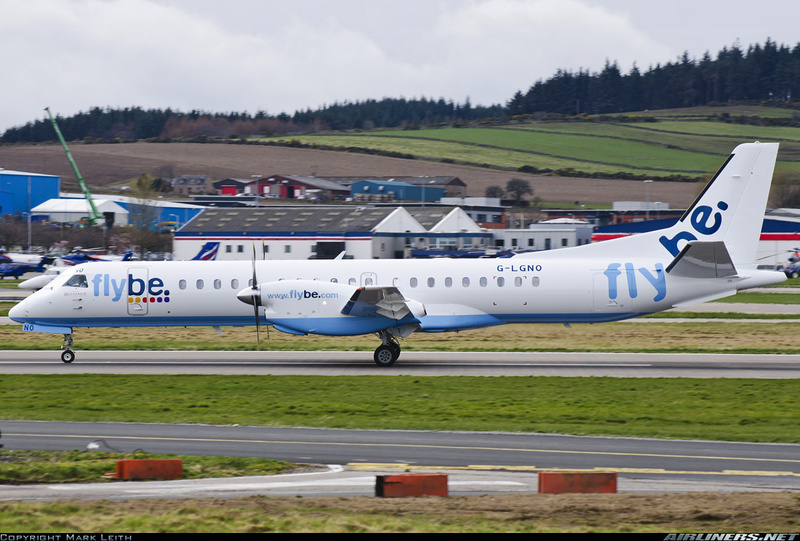 Now back to London, FlyBE has also moved to London City Airport (LCY) with newly announced routes to Edinburg, Belfast, Dublin, Inverness and Exeter. This a perfect airport for FlyBE, short runway keeps LCC’s B737/A320’s out and its a high premium yield market, business travelers who love the convenience to downtown London. This is were the airline can do very well and is bring its Q400’s to this market to handle the 4,948 ft short runway. There is no direct competition on other than Air France/KLM owned City Jet (more on this company below) with its BAe RJ85’s to Dublin, the other destinations are served by services from Heathrow, Gatwick or Stansted Airports, only Exeter has no service today from London. Now the airline needs to focus on routes that are defendable with the right economics where the airport has a short runway to keep the LCC’s B737’s/A320’s out, like Birmingham-Florence, where high yields are possible which is what FlyBE needs. Side note, British Airways serves New York from LCY with two daily A318 flights with only 32 seats for high comfort, called the “banker’s favorite route” and you can imagine the high yield on that route needed to cover 32 seats. British Airways is the largest operator at LCY serving 26 destinations with a range of aircraft from Saab 340’s to EMB-190 and A318’s. Once only a 3,543 foor runway with a 7.5 degree glideslope the airport was limited to true STOL aircraft like the DHC-7, now the approach is 5.5 degrees allowing many more different types to operate in and out of the city center airport, a good place for FlyBE to compete after it brings its CASM down as its services from LCY do not start till October 2014. Swiss plans to introduce the Bombardier CS100 in the summer of 2016 IF certification goes as planned, which it has not, and will replace the BAe RJ100’s, and start up Odyssey plans to fly from LCY with 10 x CS100’s as well. In the meantime Bombardier struggles with order, now at only 203 afte ryears of sales and marketing and taht includes 40 that Republic Airways Holdings Inc. ordered a few years back when it owned Frontier, that was sold last year to Indigo Partners and there is NO need for the CS100 in its current business strategy, but won’t cancel as that would be 20% of orders gone and that would negatively impact the Bombardier stock as investor confidence in CS program is shaken as the stock is the worst performing Canadian Industrial stock of the 21st century according to Toronto’s Canaccord Genuity analyst. It looks as if the 100-149 seat market segment Bombardier wanted to dominate, is not as big as expected, only 2% of Boeing’s B737Max and Airbus A320Neo sales are in this category (B737-Max7 and A319Neo), positioning a product is always very difficult, sadly some tough times ahead for Bombardier and its stock, recent bad news is Air Canada will keep its 25 rather young EMB-190’s and not replace them with the CS100 as many in Montreal had hoped, this news says novels about what a large national airline thinks of the CS100, it surely ran many numbers and route analysis scenarios, and the conclusion was to keep the EJ-190 ? Now quickly, Irish based City Jet (and its VLM subsidiary) a loss making regional airline owned by Air France and KLM was just sold back in December 2013 and a few days ago the transfer was completed and the new owner is Intro Aviation a German investment company owned by Mr. Hans Rudolf Wohrl, who set up Eurowings (ex-NFD) and sold it to Lufthansa for a great profit, and who specializes in buying and restoring profitability to loss making airlines that have come from larger groups and then selling them after turning them around to other larger groups. City Jet will retain its brand, route network, aircraft and codesharing agreement with AF/KLM for now. Intro Aviation has bought DBA (Deutsche BA) from British Airways and later sold it to Air Berlin for a nice profit and then long haul LTU was bought and restructured and sold to Air Berlin in 2006, later Air Berlin got into trouble, and had to restructure itself and be saved by Etihad Airways investing in it and presently it owns 29.2% of Air Berlin and the restructuring is still on going as it is still bleeding cash, acquisitions are not always such a great idea, as Air Berlin now knows. Etihad just invested 300 million Euros via convertible bonds so it is looking to up that share at some point in the future, but will be limited to being below 50%, as a EU airline must be 50% ‘effectively’ controlled by an EU state or citizen, and yes Etihad has a majority in Air Berlin’s frequent flier program. The expected plan is for City Jet and VLM to merge with Intro Aviation’s small regional airline in Austria named Intersky which operates only 3 x DHC-8-300’s and 2 x ATR-72-600’s based mainly out out of Friedrichshafen, Germany. 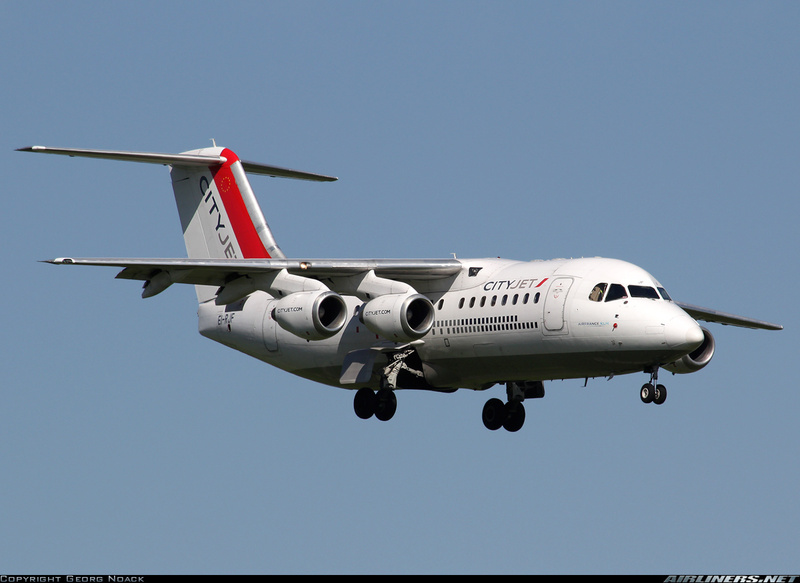 City Jet has 22 x BAe RJ85’s and 12 x Fokker F50 turboprops and flying services for Aer Lingus to Dublin from LCY as well many other routes for AF/KLM. It was the weakest of the Air France/KLM regionals, the other two are Hop (with 116 aircraft of 7 different types combined from the merger of Regional, Brit Air and Airlinar, serves 135 destinations) and NLM City Hopper with 22 x EMB-190’s and 26 x Fokker F70’s (now being retired slowly). The regional airlines owned by AF/KLM are in a mess, its a collection of many different airlines and equipment trying to compete with LCC’s but its not working and HOP is real question mark as to longevity, as Air France launched its own LCC Transavia.com France with 5 x A320’s and 11 B737-800’s (11 aircraft and 2 types-raises red flag already), again like HOP little thought went into its creation, and the poor results will show that, in time. The state of regional airlines is very difficult everywhere, in short there are none in the USA, they are all ACMI operators or CPA (capacity purchase agreements) where they just operate aircraft for a network carrier, in Canada Jazz is loosing its hold on Air Canada flying, as SkyRegional operates 5 x Q400’s and 15 x EMB-175’s for Air Canada, now Air Georgian will operate CRJ’s for Air Canada and the days of high margins at Jazz (Chorus) are over when it had the highest margin of any regional in the world, and changes need to be made, sooner the better, as Air Canada is taking the play book for DL or UA and making the regionals sharpen their pencils if they want to fly as an Air Canada Express partner. Time for all regionals to re-examine their business model and seek a sustainable business model that will hopefully see them through the next 5-10 years. I do wish FlyBE the very best in its restructuring efforts, and I think that if anyone can do it it is its CEO Mr. Saad Hammad who knows what needs to be done, and I am sure he will be thrilled knowing I approve of all his restructuring efforts! (LOL). Till next time thank you to those that read all of this, hope you learned something. « ABSTRACT: LIAT “The Caribbean Airline” on the Brink of Doom – BUT Still in Denial and Brushes Off Calls for a MAJOR Restructuring, why is it that the Caribbean is a graveyard for airlines ? no local airline has been financially successful for any length of time if there is no government ownership, and even then they go bust ! I think it comes down to poor management and political interference and corruption ! where are the accounting books for LIAT ? hundreds of millions of EC taxpayers dollars have gone into the airline, where did it all go ? a black hole that no one dares to look into ? well the EC countries are running out of money, some close to defaults on loan and bond obligations and LIAT will have NOWHERE to turn to for money, and then ? ?